Long available to the readers of Soviet Russia, here is the first English translation, in book form, of the unexpurgated papers of Karl Marx on the so-called "Jewish question." 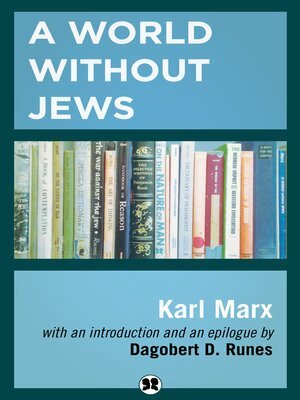 Most of Marx's anti-Semitic diatribes were carefully eliminated by the translators and editors of his books, his journalistic writings and his correspondence. Readers unfamiliar with this aspect of his thought will be startled to discover how well it has served the purposes of the totalitarian regimes of our time. It is consequently a subject upon which every member of a free society should be adequately informed. A fearless and illuminating critical introduction to this remarkable work has been provided by the eminent philosopher, Dagobert D. Runes. Extensive comments and critical annotations related to the material appear throughout the book.